Week 2 was an interesting week for the Pac 12. On one hand, Colorado knocked off Nebraska and Arizona State knocked off Michigan State, but UCLA lost to Oklahoma and Arizona got demolished by Houston. There’s every chance there could be more weird results this week. Let’s dive in. The only danger of Oregon not covering is if they call off the dog-erm, ducks in the second half. San Jose is…not a good team. Washington State shut them out last week 31-0, and they lost their opener to UC Davis. Oregon is averaging 60 points a game, and Justin Herbert looks every bit the Heisman contender that he should have been last year before he was derailed by injury. The Ducks don’t have the strongest schedule of all time, but with Jim Leavitt as defensive coordinator and Mario Cristobal running the offense, Oregon is doing exactly what’s expected of them. Take the Ducks to cover that giant -41 point spread with Ladbrokes at 10/11. Conference games are fun and usually pretty evenly matched. This is one of those games. QB Jake Browning isn’t the Heisman dark horse that a lot of people thought he might be tossing equal picks and TDs. Washington was exposed by Auburn in the highlight game of week 1, and while the Huskies pounded their week 2 FCS opponent, they haven’t shown anything else yet. Utah, on the other hand, is doing what you’d hope they would. They played NIU closer than you’d expect, but QB Tyler Huntley is looking good with 565 yards on the season, 4 TDs and a sole pick. The real surprise is RB Zack Moss, who’s averaging 100 yards and a touchdown a game. 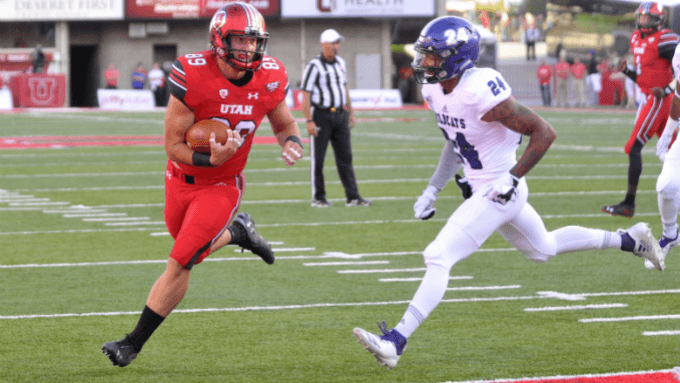 The Utes look to have a versatile attack and are allowing less than 10 points a game. Will Utah actually win? Maybe, I wouldn’t bet outright in this tight game. But the fact Utah is at home gives them a good advantage because Rice-Eccles Stadium is one of the toughest in the country. The line favors Washington anywhere from 4.5 to 6. We suggest jumping on 888sport and taking Utah to cover +6 for 4/5. How the mighty have fallen. UCLA is a mess right now, and there’s not much sign of it getting better. At least they’ll be playing at home in the Rose Bowl, but that might not be enough. A pair of embarrassing losses to Cincinnati and Oklahoma leave the Bruins looking exposed and without a winnable game on the schedule after this weekend. Fresno, on the other hand, gave a resurgent Minnesota a fight and a half. It took one of the most absurd interceptions you’ll see all year by Minnesota to put the game away. Fresno QB Marcus McMaryion should have a day against a shaky passing defense. UCLA’s best hopes are going to ride on QB Dorian Thompson-Robinson’s connection with WR Caleb Wilson, who has over a quarter of the team’s receiving yards by himself. UCLA are home dogs to a group of 5 team, and with good reason. Take Fresno to cover -2.5 at 888sport for 22/25 odds. The Herm Edwards hire was panned by pretty much everyone originally, and Herm is having the last laugh. Nobody was surprised when he beat UTSA, but knocking off #15 Michigan State was a stunner. QB Manny Wilkins is doing WORK in the backfield, over 600 yards in two games and 5 touchdowns, and his connection with N’Keal Harry is something else (229 receiving yards and 3 TDs). San Diego State is not a bad team by any stretch of the imagination, but they’re not as strong as they were last year. They were beaten soundly by Stanford, and didn’t beat Sacramento State by as much as conventional wisdom says they would. None of that makes SDSU bad, especially when you have to consider that RB Juwan Washington has over 300 yards on the year so far. Thing is, Juwan Washington plays right into Arizona State’s hands. They’ve allowed an astonishing 32.5 rushing yards on the year, and they played a Big Ten team. The story of this game is matchups, and SDSU’s matchup vs Arizona State just doesn’t work out well for them. The line varies from place to place, so bet Arizona State to cover a -4.5 spread at Ladbrokes for 10/11 odds.